Scramjet is a type of jet engine. Like other jets it pushes mixed air and gas out of the back to make it go. Like other ramjets it doesn't use a mechanical compressor. Engineers have experimented with it since the 1950s. 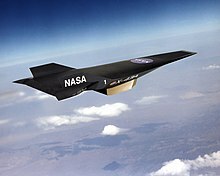 They hope a scramjet will work someday at 15 times the speed of sound (mach 15). This page was last changed on 1 January 2016, at 01:05.